Washington’s largest viticultural region, Columbia Valley, covers almost 11 million acres which represents a full third of Washington State’s land mass. The largest appellation in eastern Washington is the Columbia Valley. It consists of land comprising the river drainage of the Columbia River, including the Yakima, Snake, and Walla Walla Rivers. In the rain shadow of the Cascade Mountains, the Columbia Valley is dry, sunny, and warm (Geology, Climate). 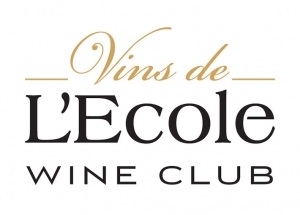 L’Ecole contracts with a number of prestigious, mature vineyards, each with a high-level focus on quality. Many of these vineyards were planted in the 1970s and early 1980s with vine-age now over 30 years. We work with the same blocks and rows of fruit each year, managed to our specifications, which contribute significantly to the trustworthy reputation of our wines vintage after vintage. We’ve selected four key vineyards to feature. Each provides fruit for at least three wines in our Columbia Valley Wine portfolio. These vineyards ascribe to our values which include a strong commitment to quality and a willingness to collaborate to make viticultural decisions that enhance our chosen wine style. The tenure, integrity, and passion of all our growers remain the backbone of our reputation for reliable, consistent, award-winning wines. 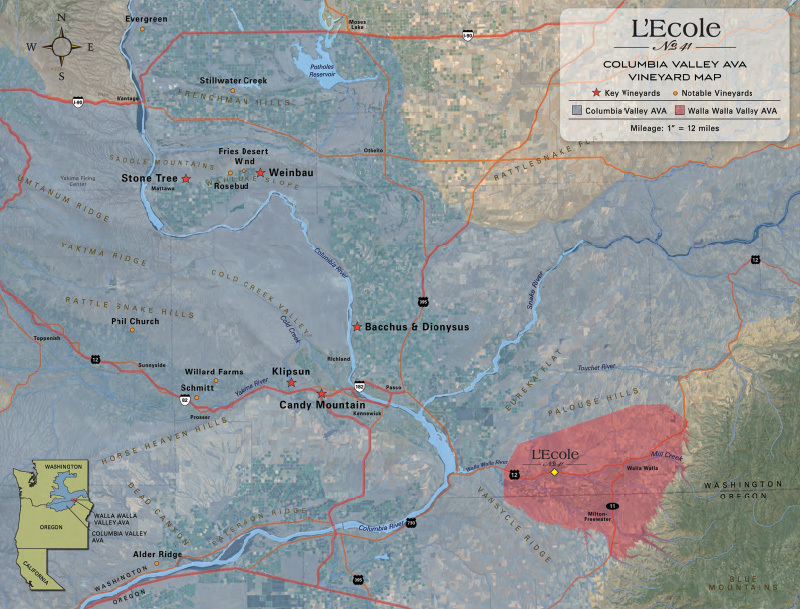 L’Ecole manages long-term contracts with these proven, exceptional key and notable Columbia Valley vineyards. Klipsun Vineyard is one of the most celebrated vineyards on Red Mountain. 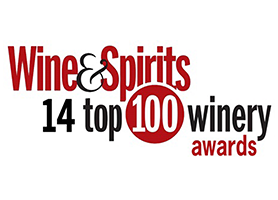 Klipsun Vineyard, one of the most celebrated vineyards in the Red Mountain AVA, was named “One of the Top 25 Vineyards in the World” by Wine & Spirits Magazine in 2003. Klipsun roughly translates to “sunset” in the Chinook language. Located on the southwest slope of Red Mountain, its dry and warm environment are ideal for Bordeaux varietals. The oldest vines were planted in 1984 and now the vineyard includes over 120 acres of vines. L’Ecole has been purchasing grapes from Klipsun since 1998, including old-vine Semillon, Sauvignon Blanc, Merlot, and old-vine Cabernet Sauvignon. Julia Koch is the vineyard manager and viticulturist. She works closely with us in managing our different blocks of fruit for the highest quality possible. 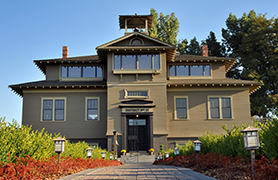 Candy Mountain Vineyard, planted in 1998, is owned by Premier Columbia Partners and managed by renowned viticulturist, Tom Waliser. Adjacent to Red Mountain, Candy Mountain is south-facing with a gentle 5% slope. The soil is almost all blow sand, typical for this area, and has been enriched with an abundance of nutrients needed for a healthy vineyard. The original 30 acres were planted to Cabernet Sauvignon, Merlot, and Syrah. We use all three varietals in our Columbia Valley wine program. The dry growing conditions and high heat units produce wines similar in style to Red Mountain, rich in extraction with ripe fruit flavors and robust tannins. Candy Mountain Vineyard, planted in 1998, is owned by Premier Columbia Partners and managed by renowned viticulturist, Tom Waliser. The vineyard name, “Stone Tree,” is derived from the fact that there were a large number of petrified tree fossils found in the surrounding Saddle Mountain hillside. The photo, at right, is one of the petrified tree fossils discovered in the surrounding hills. It has been identified as Sequoia, from the Miocene Epoch, 5 to 20-million-years-old. Located in the Wahluke Slope Appellation, Stone Tree Vineyard was planted in 2000 by Tedd Wildman, one of the most experienced and influential viticulturist in Washington. Tedd is an entomologist by training and always seems to be one step ahead of those of us working with his vineyard. 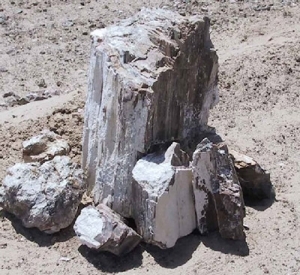 The vineyard name, “Stone Tree”, is derived from the fact that there were a large number of petrified tree fossils found in the surrounding Saddle Mountain hillside. This 240 acre, south-facing slope vineyard is at the highest elevation of the Wahluke Slope. It ranges from 940 to 1250 feet above sea level, with 200 or more frost-free growing days. The principal soil is a sandy silt loam overlain on a rocky calcium carbonate base similar to some soils in the great vineyards of Bordeaux. With only 6 inches of rain and high heat units, Tedd has focused on Rhone and Bordeaux red varietals. L’Ecole works with multiple clones of Cabernet Sauvignon, Merlot, Syrah, and Grenache. Founded in 1968, Sagemoor Vineyards was one of the first pioneering commercial vineyards in Washington State. Founded in 1968, Sagemoor Vineyards was one of the first pioneering commercial vineyards in Washington State. 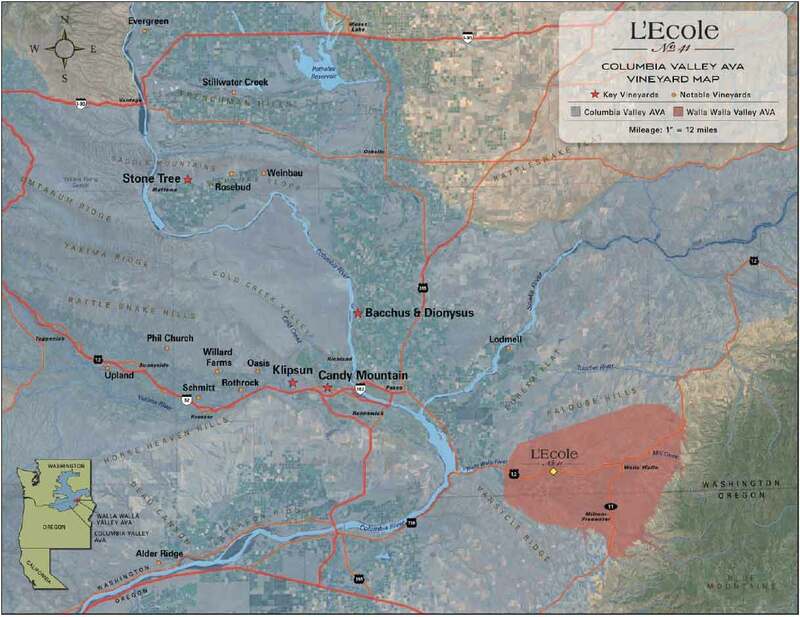 Comprised of four vineyards: Sagemoor; Bacchus; and Dionysus, located north of the Tri-Cities on the east bank of the Columbia River; and Weinbau; on the eastern flank of the Wahluke Slope. We began working with Sagemoor our very first year, 1983, and have been a client ever since. They planted some of the first vines in Washington. Our oldest vines are from Bacchus and Dionysus (1972). We have acre contracts from these vineyards for Merlot, Cabernet Sauvignon, Syrah, and Cabernet Franc. Fruit from these vineyards are sprinkled throughout our Columbia Valley wines. General Manager, Kent Waliser and Vineyard Manager, Lacey Lybeck work hard to produce superior quality fruit from each of our separate, contracted rows. They utilize precision farming techniques such as vigor mapping, deficit irrigation, soil profiling, micro-nutrient analysis, and green thinning to manage yields, balance canopy and crop load, and optimize sun exposure to ensure consistent high quality.